Swans Stats: Swans Player of the Season: Rob Green? I've recently finished 'Luck' by Ed Smith. Ed is a former England cricketer who was interested in investigating the role of chance and sportsmen's perception of it. He looks at how (both on and off the field) chance events can help define a career. Without getting too 'Sliding Doors' about it, there's plenty to suggest even though the Gary Player mantra of 'The more I practice, the luckier I get' may be true overall, for any individual event luck (or random variation) can play a major role in how things turn out. What's this got to do with the Swans? Well the reason I've mentioned Rob Green is that after 8 minutes in the first league game of the season he let in what was a fairly average shot from Michu and the rest is history. I'm not saying that if Rob Green had saved Michu's shot that roles would have been reversed and QPR finish top 10 and Swansea get relegated. QPR were pretty terrible all season but the match wasn't as one-sided as a 0-5 scoreline suggests. That first game against QPR was one of those where pretty much everything went right for Swansea, in terms of shots QPR had the majority and as can be seen by the first and second half chalkboards, it was only 0-1 at half time but Swansea managed to convert 4 of 7 attempts in the second half. The way Michu took his second was of someone supremely confident in his own ability, how much of that is self-confidence (he was in top 10 highest scorers in La Liga the season before) and how much it was boosted by the earlier goal we'll never know, but within a week he's got 3 goals and Swansea have 6 points and (briefly) top of the league. 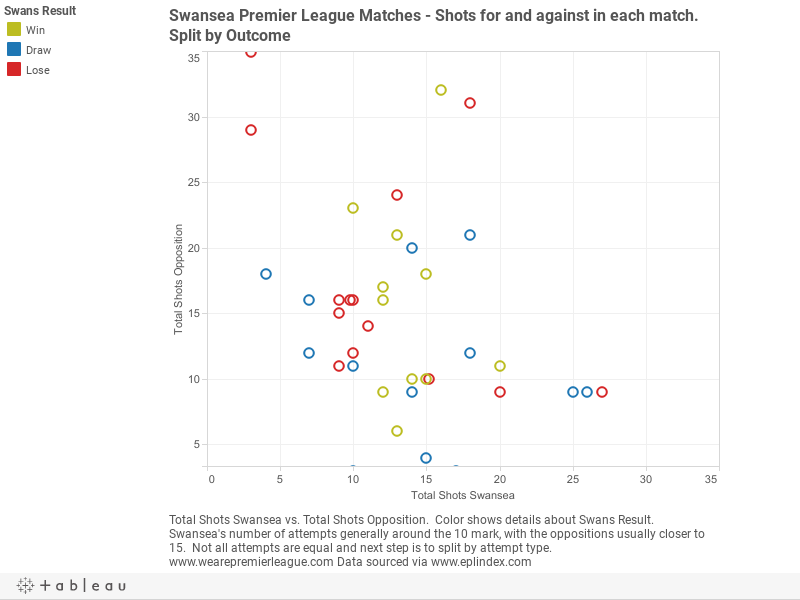 Looking at the league season as a whole, in 23 of 38 games the opposition had more attempts on goal than Swansea. The relative attempt counts range from Swansea 27 to Fulham's 9 all the way to Liverpool having 35 to Swansea's 3 in the hammering the week before the Capital One cup final. All points to the right of the blue line are where Swansea had more attempts at goal than their opponent. There are plenty of games where Swansea have around 10 attempts to the oppositions 15, most of which ended in defeat. 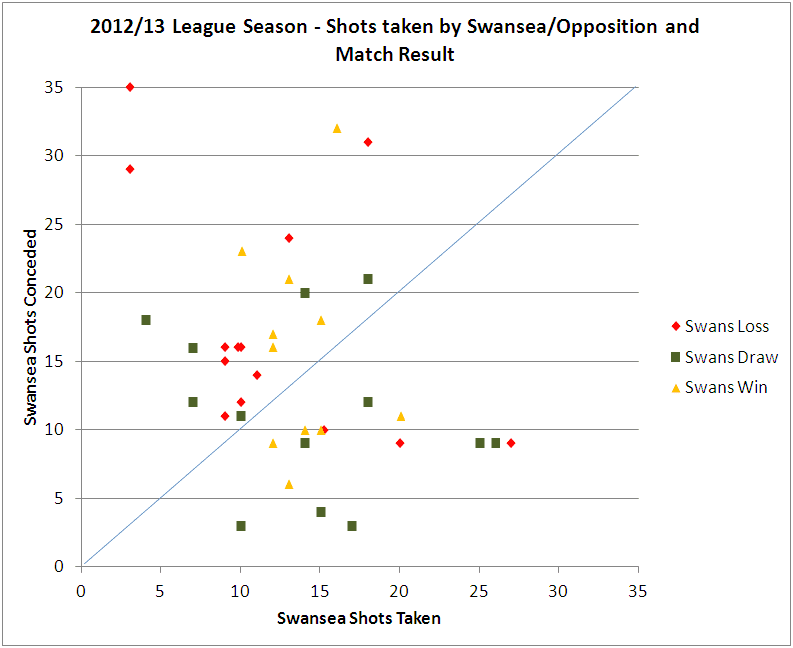 There are also numerous games where Swansea dominate the shot count but fail to win. Not all shots are equal of course, a penalty (not that we got one in the league) has a greater likelihood of being scored than a 40 yard punt. The next step is to break these attempts down in more detail to work out which games were 'deserved' wins or 'unlucky' defeats.